Monitor project progress with our free dashboard template. Track task status, budget and even see a Gantt chart of your project progress. A dashboard is an essential project management software tool that provides you with an at-a-glance overview of your project. Download yours today! The project management dashboard are your eyes into the overall workings of the project. It provides an at-a-glance view of the KPI, or Key Performance Indicators, of the project. Think of it as a progress report at the tip of your fingers. The dashboard offers views of cost, budget, time, health, workload, progress, risk, issues and changes, plus so much more, in the project. All those areas are collected on one page, and that page is populated by graphs that record the data visually for a project manager to easier digest and get a snapshot of where they are in the lifecycle of the work. A project manager needs a bird’s-eye view of the project, and the project dashboard offers the ideal perspective, which gives a leader all the pertinent information needed to make the right decisions. The free project management dashboard is a perfect document for collecting all the various aspects of a project so that you can have this necessary insight into its progress. The project management dashboard can also be used to create specific requests. Focus on one of the many sections of the project and generate a graph from the dashboard for a visually compelling presentation. Hard numbers are fine, but if you’re trying to communicate, it’s best to have an engaging story, and a presentation with visual aids such as the graphs made by your dashboard is more likely get the point you want across clearly and quickly. Once you’ve downloaded your project management dashboard template, it’s time to get the project information into it so you can now profit from all the potential benefits of the tool. Your project is made up of tasks. Here is where you want to list them, all of them. 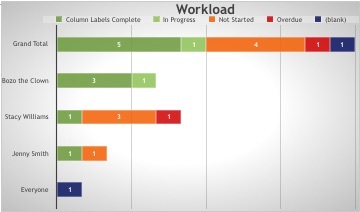 Once that data has been imputed into the template, you’ll be able to color-code it to represent whether that task is complete, in progress, not started or overdue. The pie chart will also show you what the grand total is, and note the percentages, for those of you who prefer a hard figure. Next, you’ll need to address the workload. 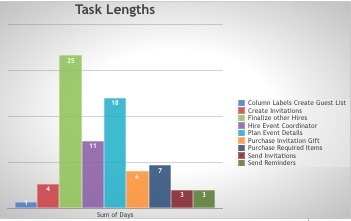 This bar chart is composed of every team member, with a line item for the group as a whole. Their progress is color-coded to include if the work is complete, in progress, not started or overdue. You can of course customize the coding to match your project and the workload you need tracked. Having a task list and incorporating it into the tasks chart in your dashboard is a good start, but adding another graph to note the duration of the tasks will help to point out what is taking too long and requires more resources to complete. Here is where that information is stored. The budget is one of the most important parts of project planning, and when you’re in the midst of your project, it’s crucial to make sure those estimates you made are accurate. If you don’t have a chart like this cost one in which planned versus actual budget figures are calculated, then you don’t have a financial tether on your project and it will go cost you money and possibly the very viability of the project itself. The free project management dashboard is a great tool, for all the reasons stated, but it can be so much more when part of a robust project management software program like ProjectManager.com. Then how do you import this document? Well, you don’t. However, if you’re managing a project from a group of Excel spreadsheets, where the project management template is but one of many, or if you’ve been managing the project with Microsoft Project, then you’re in luck. ProjectManager.com has been designed to convert these static documents into its system and in so doing give you an interactive and collaborative platform that gives you more control and insight into the project. Begin on the ProjectManager.com homepage and click on the dropdown menu on the upper left-hand corner of the page. Then scroll down to the import selection, hover over it and another window will popup. Chose what you want to import. Once the Excel documents or Microsoft Project has been imported as a new project in ProjectManager.com, your data will populate the dashboard in our software. It’s as easy as that! Once your data is in ProjectManager.com you will be able to do more than merely use a formula to add up column amounts. For one thing, you’ll not have to take the time and effort to manually create reports. Just filter the information to customize the dashboard chart you want and then with a click of a button it’s shared as an email attachment or across your team and/or stakeholders in a variety of formats. 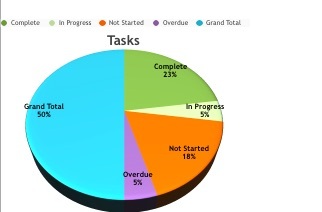 Another advantage of ProjectManager.com’s dashboards is that they calculate the data in real-time. That’s because your team is using the cloud-based platform to input their tasks as soon as they complete them, updating their timesheets, which automatically brings the dashboard up-to-date as well. When you use a dashboard in ProjectManager.com, your data is always up-to-date. You don’t need to waste valuable time creating a report for a presentation. Data is easily shared via the web or mobile devices. You can even share that same live data in your presentations. Not to mention that the dashboard improves the impact of those presentations. It offers a more visually engaging presentation and creates a clear and immediate summary of the data you’re presenting. It merges utility, usability and beauty, and can be easily customized. There’s so much more you can do with a dashboard. ProjectManager.com has a blog that posts articles and videos regularly on our site. It’s a hub for project management professionals and novices alike to gather and learn more about the fundamentals and more arcane aspects of the work. We’ve written extensively about dashboards, and here are a few of the more recent and relevant posts. Go to ProjectManager.com to read more. Thanks for downloading our free project management dashboard template, and hopefully we’ve convinced you of the benefits of using a collaborative online project management software program like ProjectManager.com. If you want to see how your data becomes more accessible and drives productivity when imported into ProjectManager.com, then go to ProjectManager.com and sign up for a free 30-day trial. ProjectManager.com has been ranked #1 by Gartner’s GetApp repeatedly as the best project management application. These rankings are by independent users just like yourself, so why not try it yourself and tell us what you think. We believe you’ll agree that nothing manages a project better than ProjectManager.com.